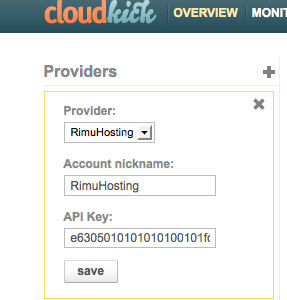 Cloudkick have just added support for RimuHosting as a provider. Cloudkick help you mange and monitor your 'cloud' servers. They use provider APIs (like the RimuHosting server management API) to keep track of your cloud server list. Offer tools like reboots, ssh consoles, and - importantly - monitoring. Here is a quick tour. First up, add RimuHosting as a provider. And plug in your RimuHosting server management API key. Cloudkick will automatically load your server list. You can run a reboot (or a 'destroy'/cancel+shutdown). And lo-and-behold it'll reboot the server. Cloudkick also has a cool AJAX ssh console which ssh-es to your server, providing you have added the Cloudkick public key to your server's ~/.ssh/authorized_keys. Now that Cloudkick knows about all your servers it can now get more interesting. A key feature of Cloudkick is its monitoring. It lets you setup a monitoring task for one or all of your servers. The no-cost 'developer' account supports 'basic' checks like HTTP, Ping ,SSH. The paid plans contain some more interesting monitoring options like IO, CPU, disk, bandwidth and a few others. The tag feature is interesting. You can tag each of your servers in the Cloudkick UI. Then query those tags for your monitoring. e.g. so that when you later create another server tagged with 'db' it performs all the regular 'db' checks. Alex reports it'll be there in a day or two, it just got held back from the initial release ('You know how software development is.'). I am really looking forward to seeing how they implement the VPS creation functionality and posting an update about that. This entry was posted in Rimuhosting and tagged api, cloud, kick. Bookmark the permalink.